If you're in the market for a new laptop bag that will last you for a long time, then you should look into some of the stylish leather laptop bags for women available in the market right now. 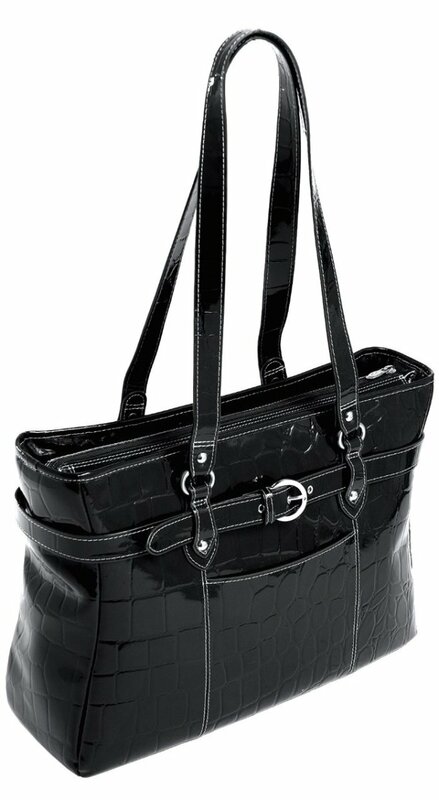 Far from staid or boring, the best women's leather laptop bags, are stylish, cute and/or trendy. These ladies laptop bags come in a variety of styles, such as totes, messenger bags, backpacks and more; and also various colors, the most common ones being black, brown, red and tan. 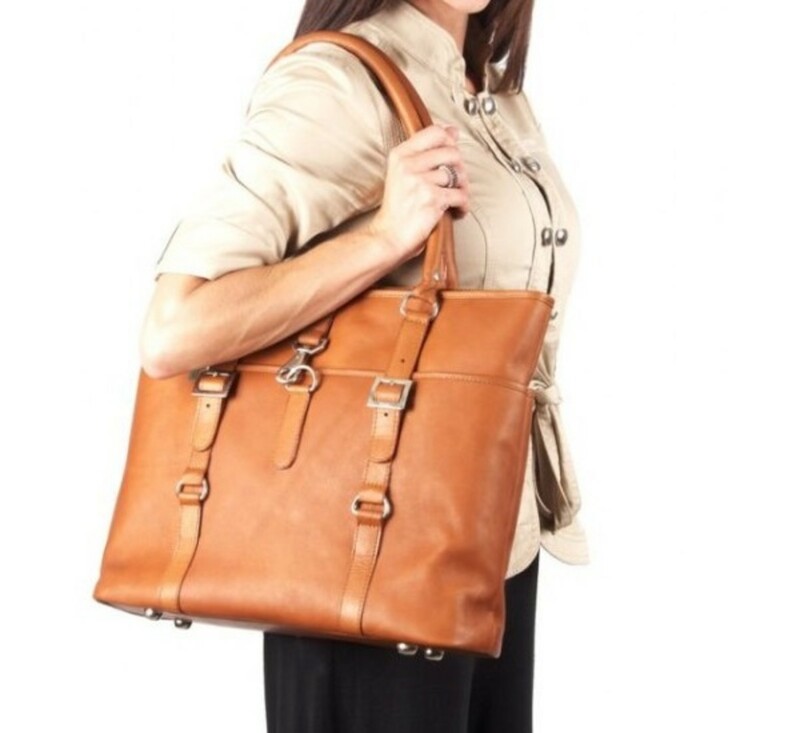 Here we have a variety of women's leather laptop bags to choose from. You can choose from the many different features and/or specializations built into the laptop bags. While this is definitely a feminine laptop bag and a welcome change from the usual more boxy briefcase/messenger bag styles, it makes a professional impression. Looking at the bag, this laptop tote is well made and sturdy, made of good quality leather that will look batter as it ages. It has loads of pockets and compartment for everything you need to carry with you. An outside pocket with place for your cell phone, computer accessories as well as your makeup and wallet. The top opens up in to a large turquoise lined interior with a padded compartment for a laptop with Velcro flap to cinch it into place and no zippers to scratch the case. And it's a definite bonus that it can always double as a beautiful handbag in its own right. 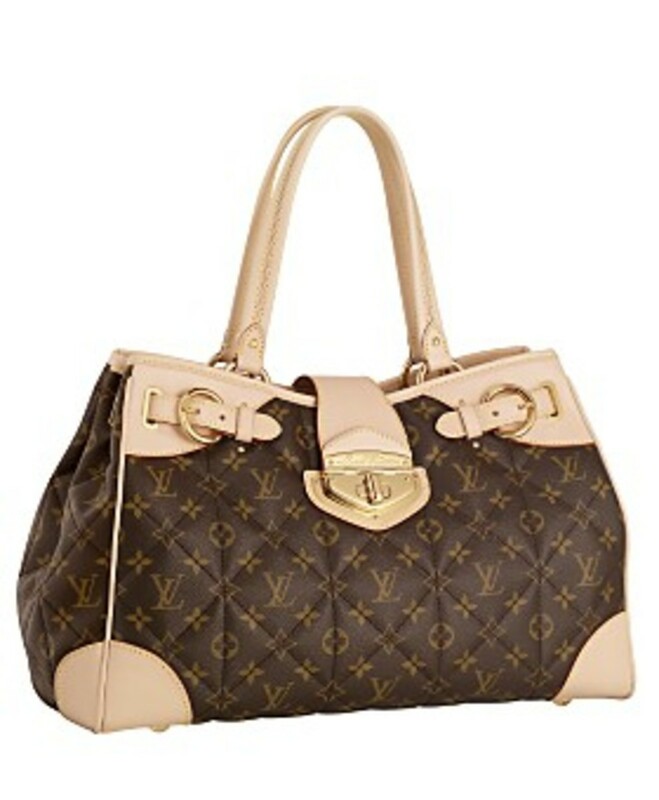 This is a big bag but because of the vertical shape it looks a reasonable size. Classy looking for not a lot of money. 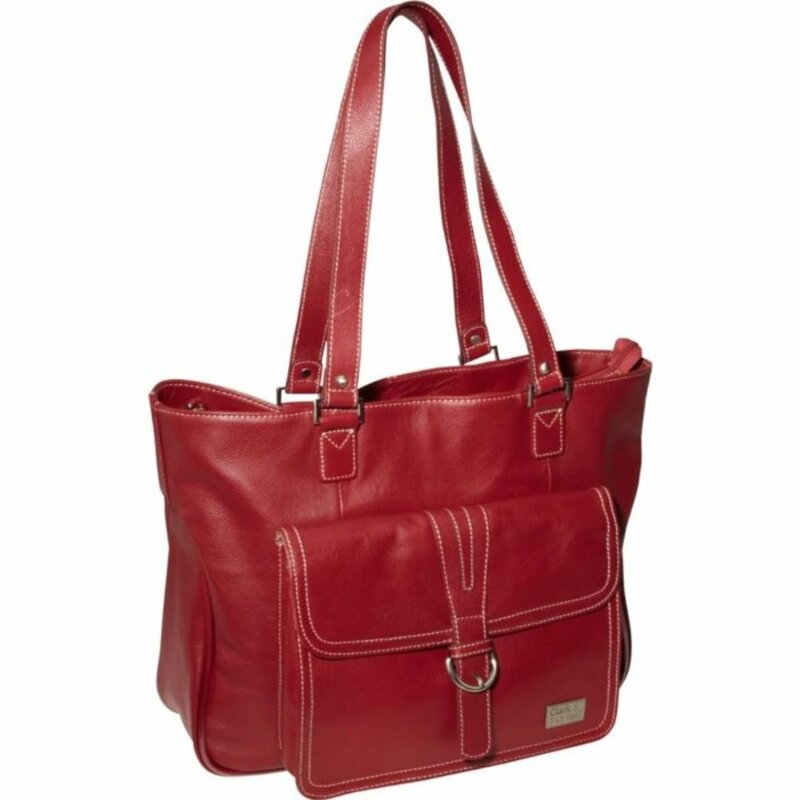 Clark & Mayfield Stafford Pro Leather Laptop Tote 15.6"
A wonderful fully functional laptop bag that looks professional yet more feminine than the typical laptop bags around. This bag is made with the business women in mind. And it includes all the little things that are missing from other bags. 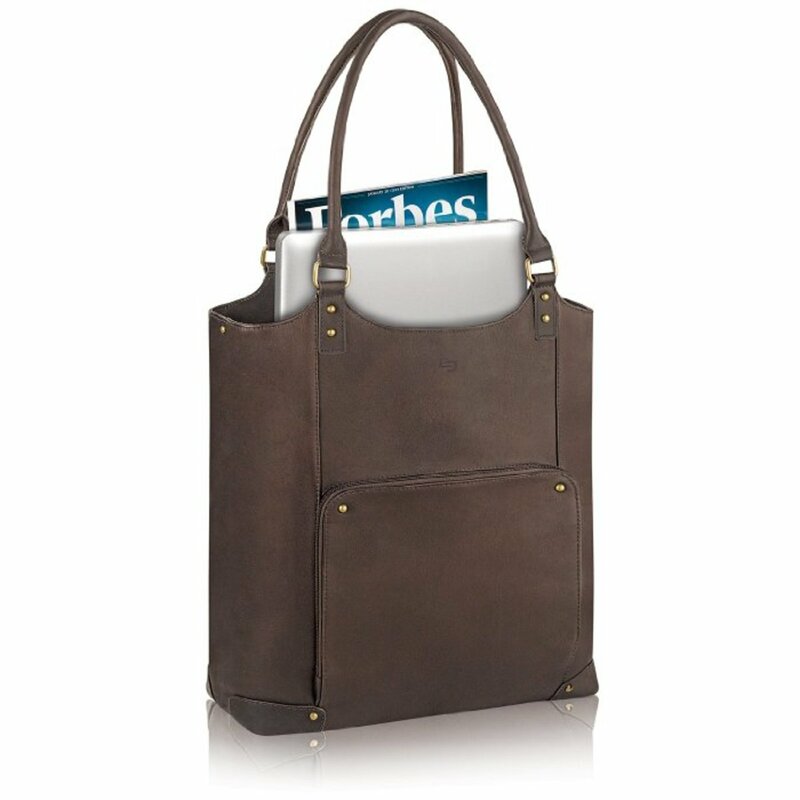 In Clark & Mayfield Stafford Pro Leather Laptop Tote, Clark & Mayfield has created a professional leather tote that is a perfect for commuting to work every day. The top grain leather used is soft with stitching in a contrasting color, an accent buckle on the front, and multiple pockets for all your gear. Access to this laptop tote is through a top zipper, with the inside lined in a durable nylon lining. Inside features include a padded laptop sleeve in the center, a compartment for files, documents, and folders on one side, while the other side has deep pockets for laptop peripherals and small interior organization pockets for pens, business cards, flash drives, or other small business accessories. On the outside there is a purse like pocket with a flap closure into with you can store your cell phone, pens, keys, ID, credit cards, cosmetics, and other essential personal items. The bag goes over the shoulder easily. It is very roomy for laptop, papers, Bose, cables and your personal things and has a strap to slip on any roll-aboard handle. It looks very smart and professional. 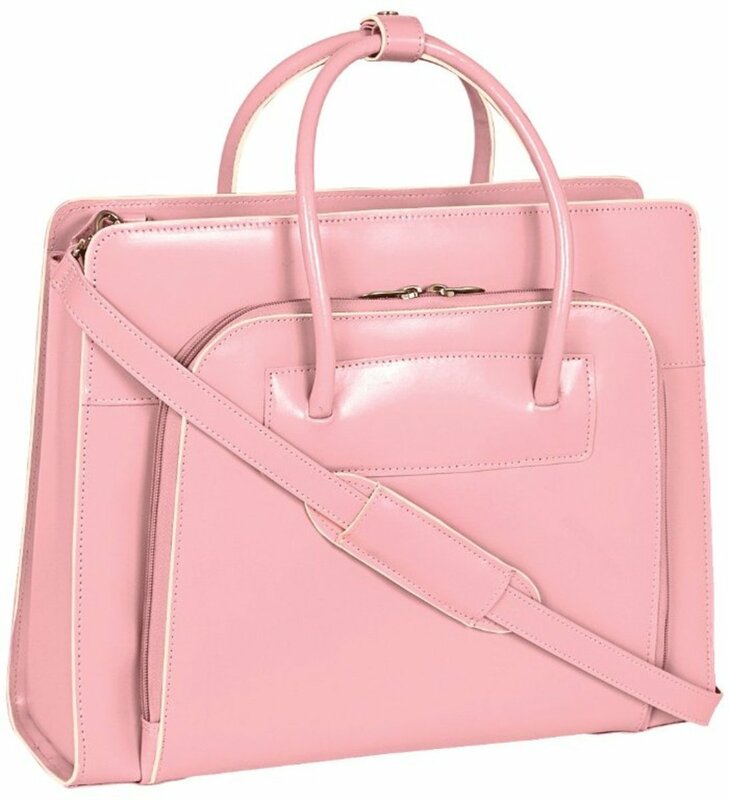 This very feminine and professional laptop bag is both stylish and amazing roomy. It is very well organized with multiple pockets, the zipper opens all the way which makes it easy to get your notebook in and out and to find stuff. The light colored lining makes it easy to find things inside. the sturdy bags is made of good quality leather and the stitching is both beautiful and strong. 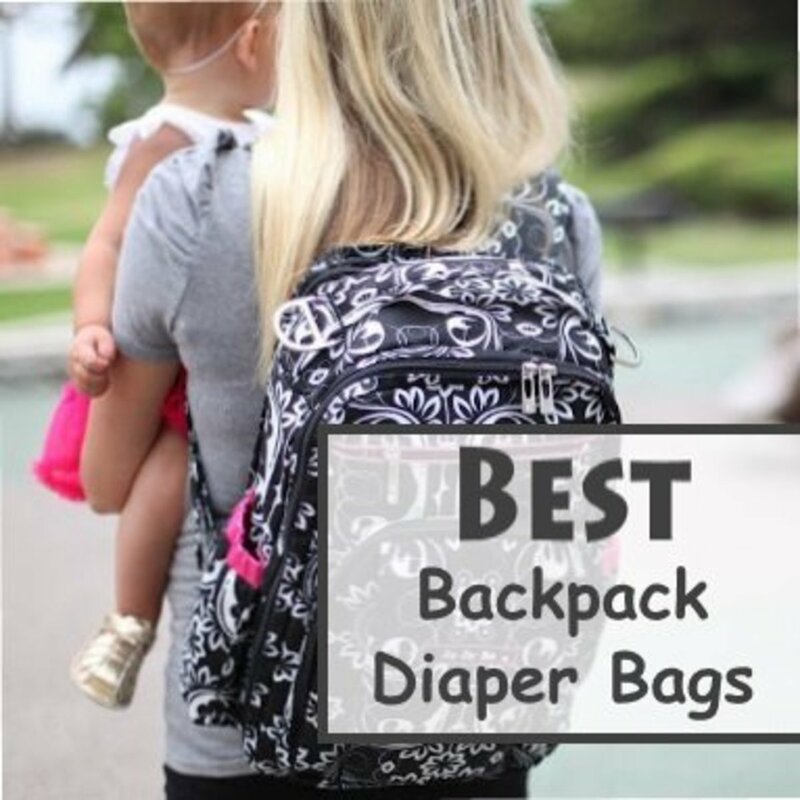 Some reviewers have mentioned the bag is on the heavy side, but that the pros outweigh this. The McKlein USA W Series Lake Forest Leather Ladies' Briefcase is a professional looking laptop bag that enhances your own style and emphasizes your professional approach and excellent taste! This beautiful briefcase is crafted from excellent Italian leather. The non-slip arm straps are stylish and durable leather. The main compartment has more than enough room for your business documents and a laptop up to 15". In the front is zippered organizer with room for your personal things, such as your cell phone, pens or business cards. Removable high density laptop sleeve protects laptops up to 15.4"
Dimensions: 16 1/2" x 5" x 12 1/2"
Made from resilient, patent leather, this laptop tote is very well made. Looking like a designer leather bag, this laptop tote doesn't really look like it is a laptop bag. On the practical side, the straps have been reinforced where they meet the bag making the bag so much stronger. The inside lining is made from a light colored soft canvas that makes finding your items quickly and easily. Access to the main compartment is through a top zipper. In the center is a padded laptop compartment that can hold a small computer. Even though the bag can hold laptops 15.4 in size, but not in the padded compartment, which only hold laptops under 13". A 15" laptop will fit in one of the compartments on either side of the padded compartment. One of the compartments is great for documents and files, while the other compartment has an organizer for your pens, laptop accessories, etc. 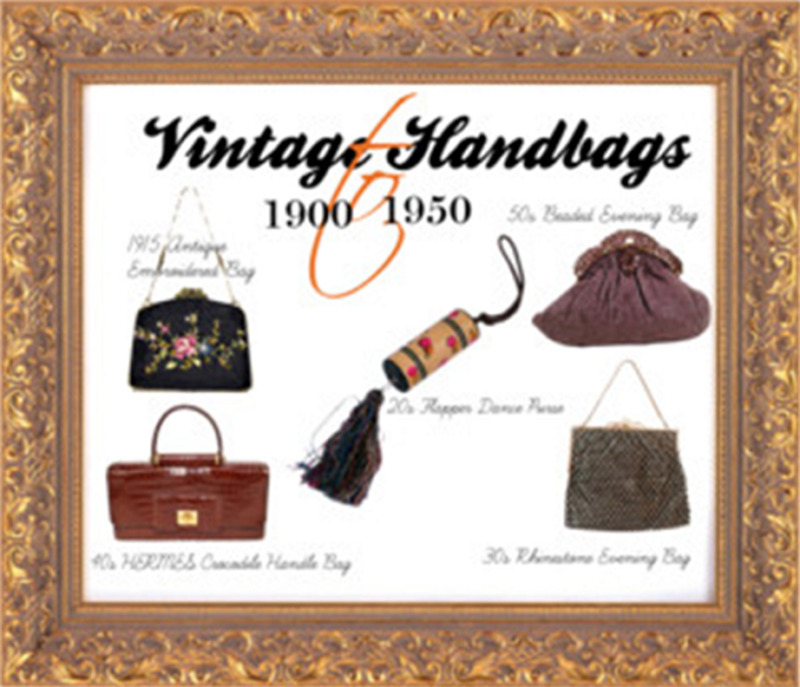 The Genuine Vintage Leather Laptop Bag for Women is basically made of vintage looking golden colored leather. The quality is amazing, and the stitching and organization of the bag is perfect for any professional woman who needs to carry a good looking bag that can fit her laptop and all other necessary accessories. Designed for the Executive Modern Women in Mind! Genuine Vintage Leather Laptop Bag for Women. 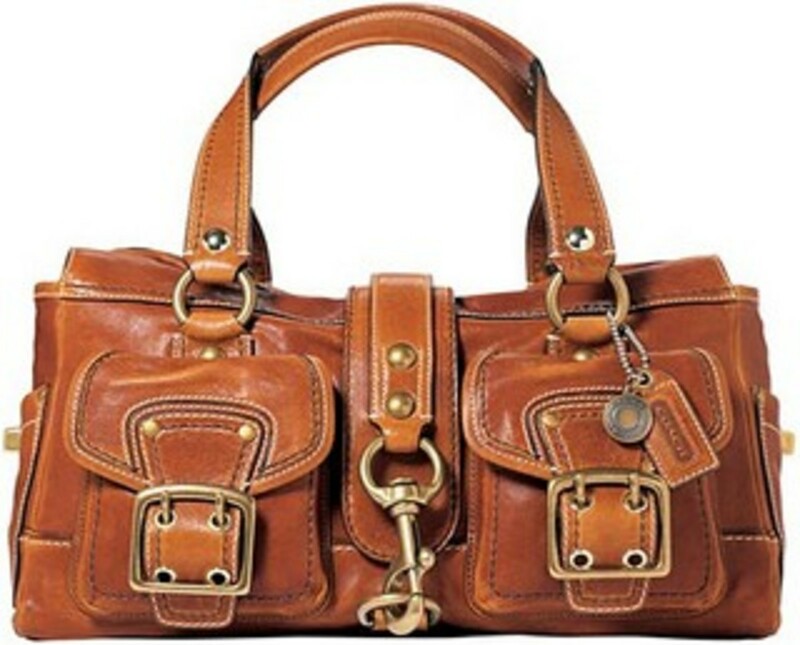 There is a large selection of beautiful and stylish women's leather laptop bags to be found. They come in various styles, sizes and colors. The colors include the classic brown, black and tan to the more fashionable and modern colors such as red, green, pink, blue, orange and more. When looking for the best leather laptop bag, not only do you want to know you are indeed getting a genuine leather bag, a laptop bag will meet your needs in terms of size, durability and comfort. If you need a good, hard wearing men's laptop bag, you are unlikely to get any better then a leather bag. When looking for the best laptop backpack for women, to carry your laptop, you can some wonderful choices of stylish, cute and/or unique backpack laptop bags that look good, practical and functional. There are some really lovely laptop tote bags for women, stylish, cute, some even both. Many look professional enough for work, while some are more casual and would work great for school as well. When I first started looking into for an 18 inch laptop bag, I quickly realized that choices for good large laptop bags is limited. Check some of my other articles highlighting laptop and computer bags, cases and backpacks. Way better than the standard laptop bag I used for so long. Recently my father gave me a handbag big enough to put my laptop in, it's even more comfortable. My favorite is the Claire Chase laptop backpack! I really love the leather laptop bags and how you presented them here.